Coffee aficionados often find themselves in the same headspace as engineers. Simplicity and innovative design render new ways to enjoy a brew. This leaves the novice with many questions about applying technology to their drink. What gadgets need to be on hand at home? How does one collect the basics to make the most varieties? Perhaps the best place to start is in the difference between two very important devices: The Stovetop and the French press. The Stovetop and the French press Methods of making coffee are similar in their simplicity and innovative design, but the coffee you get at the ends of each processes is quite different. While both methods will get you a good strong cup with plenty of texture to it, they aren’t meant to give you the same result. This contraption has been around since the 1930s, so chances are you’ve seen one but never really thought about its difference from a regular coffee pot. The Moka Pot carries with it the historical shift from espresso as a beverage which was only available in restaurants or cafes, to one that could be closely replicated in the home. It’s certainly a unique appliance. 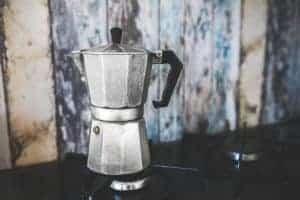 The Moka pot is used by many as an espresso substitute although it can be considered to compete with the real thing in terms of taste and it’s way ahead in terms of practicality. Moka pots are often referred to as Stovetop Espresso makers or sometimes as cowboy coffee makers. Here are some of the more popular moka pots sold today. Perhaps the name ‘cowboy coffee’ refers to what could happen if you’re not very skilled or lucky when using the instrument. A layer of thick coffee residue is left at the bottom of the pot in most cases. Or it could be the rugged and simple construction. Made of stainless steel and aluminum, fairly compact if you were to strap it to the side of a horse, and only three pieces to worry about. So they’re relatively easy to clean in comparison to a large format espresso machine. It’s important to keep in mind that Moka pot coffee is not true espresso. The process here varies quite a bit. The pot itself is an ingenious design. One chamber for water, one for grounds, and another for the finished product. 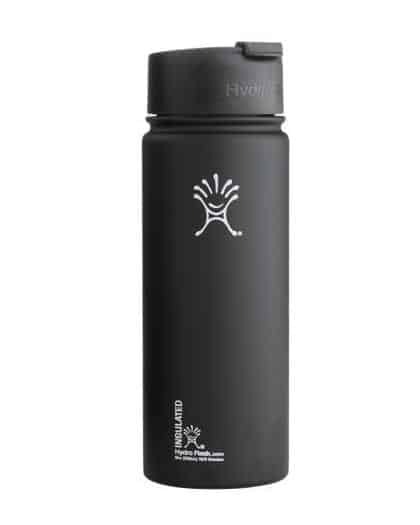 As your stove top, campfire, or range burner heats the water, pressure will push the heated water up through the central stem and through your coffee rounds, and then out into the final chamber for the coffee to stay warm yet unaffected by the spent grounds. This allows for a brew that is fresh and strong. One could use just about any size grind, depending on preference. 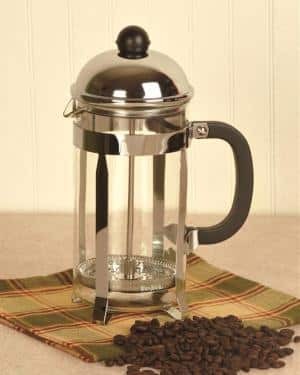 The French press makes good old-fashioned strong coffee and the method is over a hundred years old, while the coffee is sometimes bitter, many coffee lovers appreciate the strength and intensity of this simple brewing method. Although the patent for the French press was filed in 1929, it’s origin is thought to have been much earlier. Originally it’s plunging mechanism featured cheese cloth to strain grounds from the heated water, but today we are fortunate enough to have a plunger equipped with nylon mesh and a glass beaker as our mediums. Here is our list of the best French press coffee makers sold today. The coffee to water ratio is perhaps the culprit in the strength of the French press. While your drip coffee maker is one that will often take as little as one tablespoon per six ounces of water, the French press might take one more tablespoon with the same amount of water. As one progresses in their coffee tasting journey, their palette might begin to prefer the richer taste of a French press over plain old drip. That makes these contraptions a popular staple of cafe’s around the world. While the Moka pot is using pressure to deliver your hot coffee, the French press actually uses a kind of steeping process. If that catches your interest, isn’t now a good time to understand how to prepare coffee with a French press? To begin, bring your water to temperature, slightly under boiling and let sit while you grind up some beans. Try to get a grind that is coarse and somewhat flaky. Experimenting with different grinders for your French press is very necessary, as the grind is arguable the factor that will affect your final product the most. Pre-ground coffee will not be ideal, although you’ll typically get some sediment in the final product, pre-ground coffee will likely make a mess. Keep in mind that once your beans are ground you’ll want to use them before the staling begins, within thirty seconds. Once water is added the wet grounds are tamped firmly into the bottom of the carafe with the fine-mesh plunger, which is situated through the lid. Although the idea is to separate the final mixture form the grounds themselves, this is not always possible. Though there is some room to experiment, it is often recommended that you steep for three and half to four minutes. Serve immediately. The quick low-pressure brew of the stovetop method makes for different results than the longer brewing time of the French Press. 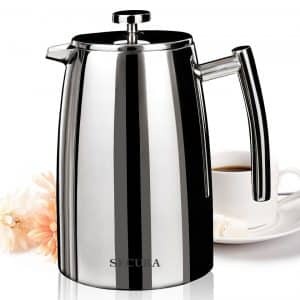 The stovetop brew is a quick pressurized burst through finely ground beans, whereas the French Press has the longest brewing time of all the coffee brewing methods, using a very coarse grind. It needs to be said here that while it takes about 5 minutes to get coffee from a stovetop pot, the water only comes into contact with the coffee once it is hot enough to generate the pressure needed to force it up through the grounds. This means the actual brewing time is quicker than you might think. For the French press, that whole 4 minutes is spent brewing the coffee, so there’s a big difference in contact time. The longer the brewing time the more flavor is removed from the beans. But the French press method is prone to over-extraction of the beans, which can make for a bitter tasting cup for those not paying attention to the timing. Once the brew is finished, you might notice that you’ve got quite a lot of coffee that hasn’t journeyed to your mug. Make sure to relieve the grounds from sitting in the tank, as this will once again over-extract your coffee and ruin what you’ve just spent so much effort creating. 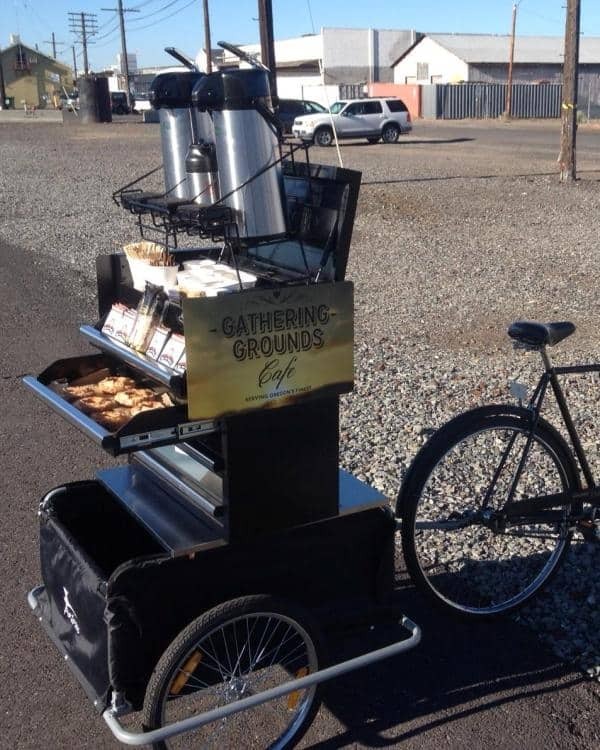 We recommend you use a dedicated thermal carafe for this. The French press is commonly misused and often gets bad press (forgive the pun) just because people aren’t using it properly. See our article comparing the French press to the percolator for more on that brewing technique. The French press, a percolator, and the Moka pot are all common options for campers. Depending on the journey, one of these is bound to make it on your trip. Take into account the durability of each, and the size of the group and duration you’ll be out. If you’re still searching for delicious coffee, and have a bit more patience or time in the morning, then try this technique out. Fresh grind some coffee, go for a medium grind. It’s worth applying a digital scale, this hones in your taste profile and if the coffee comes out poorly, you can simply change the weight. Make sure you use soft water. Even if that means getting some bottled water from the store. Once the water, about 500 grams, is near boiling, pour over your grind in the press. Let sit for about four minutes. As the coffee begins to “bloom” and noticeable grounds begin to rise and float, take a spoon and gently removing them. At this point one should not attach the lid and plunger. Now the patience comes in. Leave everything alone for five minutes. The remaining grounds will settle at the bottom. Once minute eight or nine has been reached, you may continue the process. Not so bad, right? Attach the plunger but simply let it sit on the surface, fully retrieved with the lid on. You may now pour your brew into your favorite mug and enjoy. The plunger, in this case, is simply used to strain debris and the lid to help pour. Notice that there is a lack of sediment and sludge, as well as a bold finish to the beverage. The Cupping technique, as a brew method, seems to break all the rules we previously laid out. This is the beauty of experimentation! Perhaps the brewing process is slower with the addition of the break and ‘cleaning phase’ (the stir at around 4 minutes), there is still ground coffee and water which mixed at the end of that patient process. Some coffees taste utterly fantastic this way, but researching what single origin beans or blend works best is also worth investing time into. That said, this might not be your average morning routine method. It’s a time sensitive process, but this is a great way to change it up on your Saturday morning. Like the French press you’re able to customize your brew with little changes here and there. One of the biggest issues that connoisseurs notice with the Moka Pot is under-extraction. This is a big contrast to the French press, which is thought to over-extract. There are some modifications to the traditional instructions that one can make to optimize the brewing process. This is especially worthwhile if the Moka pot is your staple coffee maker. Make sure to pre-boil the water before using it in the stovetop maker. Some experts believe this is going to help the quality of the water. Mostly, the jury will report that heating your water prior is going to optimize extraction and save precious time. Grind your beans a little more finely than usual. As you tamp your coffee in the filter basket, make absolutely certain that there are no grounds on the threads of the reservoir. This could cause a leak in the pot itself, but what is more common and actually so mundane that it goes unnoticed quite often, is that these sticky grounds will dry up and burn. This burning effect is not the kind of smoky flavor you want in your brew. So let’s keep it clean, people. The stovetop itself doesn’t need to be very hot. The water you added to the lower chamber is just off the boil. Though a high heat setting will speed up the process, it stills lends itself to the under-extraction that we’re trying to avoid. Be careful not to go to low though. The coffee still needs to flow upward through the central stem and not return back through the grounds, burning them or over-extracting in the process. 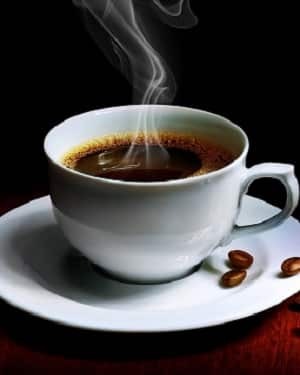 Once you notice that the water has changed color (from honey to brown or dark brown, depending on the bean) it’s likely safe to take off the heat and serve. This technique might be a little more involved than the instructions that came with the stovetop unit, but with some practice it’s easy to see why some find this to be superior. Both stovetop and French press are very popular home-brewing methods here in the US and especially in Europe. They both give good, strong coffee: the French press method gives a long coffee to be enjoyed slowly, the stovetop has a similar intensity but is intended to be drunk quickly. As with all short and strong coffees, the stovetop’s brew lends itself well to forming the base for many other drinks, just by adding hot milk and flavorings. 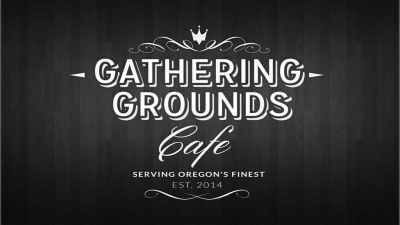 Therefore, at Gathering Grounds we believe that all coffee has its role, and both stovetop and espresso make for great methods for use at home or work. Coffee doesn’t need to be complicated and these time-tested methods will give you a great cup if you like the strong stuff. The equipment is a very small investment considering its usefulness and practicality. Related – Can you make espresso without a machine? Here are a few coffee makers we recommend. In fact in most cases we encourage our customers to own one of each device as they are very different and both brewing methods produce a much more interesting and delicious cup compared to standard drip coffee. 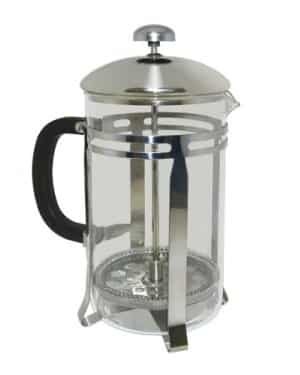 You can also see our full selection of French press pots here and our stovetop moka pots here.